I’ve been using Nambu for a few weeks now, and raved about it to friends, via Twitter and on this blog. While it’s encouraging to see the developers continue to push out new releases, the instability of the app has lead me to stop using it, for now. While I very much enjoy the layout, ease-of-use and Mac-iness of the app, crashing everytime I send a message or follow someone just isn’t going to cut it. I’ve seen Nambu suggest deleting the application’s “database,” but that forces me to continually enter in all the accounts I was using there. I’ll keep an eye on it, but the search continues for a desktop Twitter client that can do multiple accounts, and do it awesomely. First stop – Tweetie for Mac and Seesmic Desktop. I’m ready for my world to be rocked. Does Social Media Level the Media Playing Ground? I was born and raised in Erie, Pennsylvania. Neslted on Lake Erie, it’s the fourth largest city in the commonwealth and it its a great place to live, work and raise a family. Media wise, there’s 1 daily newspaper, two companies that control the radio stations (read: very little local programming) and 4 TV stations, again run by 2 media companies. In 2003, I started a directory of Erie bloggers, as there wasn’t a good list. It started off as a subdirectory of a domain I owned, and for a year or two it grew very slowly. Over time, I added in a blog, updated rather infrequently, that talked about local issues. In 2005, I had a partner and a new domain name, ErieBlogs.com. Reaching a couple of hundred people a month, it was a fun hobby and we started to build a nice little community. We commented on each other’s blogs, we linked to each other, it was great. We also merged with another local blogger who was doing a blog, updated daily, covering news and events around the area. We started selling ads and formed an LLC. Our little hobby had turned into a real business. Fast forward to May 2009. The blog marches on. Now on my own, the site reaches 35,000 readers a month, a couple of hundred thousand page views and it makes a small scratch of money. We hold a yearly blood drive, we’ve raised money for a local parents of autistic children group and people locally have helped me raise almost $3,000 over the last three years for the March of Dimes. Now that you have a little background, let’s get the meat of the post. The Press and Tower is a blog that covers media happenings in Erie. 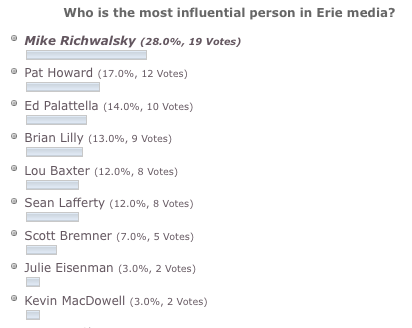 This week, they are running a poll asking people who the most influential media person in Erie is. I was included on the list, which is an honor. The other people on the list are media professionals from the TV, print and radio worlds. After a day or two, I’m winning. Let’s be honest. There’s no way I’m the most influential media person in Erie. I run a small blog that doesn’t make any money and I do it on my own. I think in 2009 and going forward, blogs and social media can be a part of the mass media landscape. While I can’t compete with media conglomerates for eyeballs (its especially hard not having a newspaper I can fill every available inch of unused advertising space to promote my website, or reference it on every newscast and station break on TV), I can do something that they are struggling with. I can build a community. I can help people connect, converse, share, experience, learn and more. Since I’m a one-man operation, we can be very nimble and jump into and use technologies like Twitter and Facebook. No corporate oversight or overhead here – our decisions and actions are driven by what’s best for our community, not the bottom line. When I meet people in Erie or we’re talking about my site, they often say its the first place they go in the morning for a quick news recap and they go on their way. Maybe they come back to see a job posting or what local blogs have updated. They leave insightful comments that rarely turn into the flame wars that were once found when the newspaper’s website had comments enabled. For the most part, it’s a civil, engaging place. To show the power that a medium like Twitter has, and how you can use it, I linked to that survey from our Twitter account and asked people to vote for the small guy (i.e. me). So, in 2009, why can’t an independent blog be part of the larger “mass media?” I think it can. What’s the takeaway for higher ed? Respect your community, and base your actions on what’s best for them. Engage them and keep them part of the process. You’ll see a definite return on that investment.